Multi-vendor storage management software and capacity monitoring done right with SolarWinds® Storage Resource Monitor (SRM). Simple to understand dashboard view of multiple storage devices from EMC, NetApp, Nimble, INFINIDAT, Pure Storage, and others. SRM storage management solutions can offer a detailed view into storage arrays, RAID groups, and LUNs, which can help make it easier to identify storage performance problems quickly and fix faster. Save time and money with Storage Resource Monitor’s automatic capacity forecasting feature. Out-of-the-box storage system management reporting can help eliminate assumption-driven decisions. Seamlessly integrates with other SolarWinds products to provide a comprehensive picture of IT health. The AppStack™ dashboard gives you an instant view into your infrastructure, from application to storage. Monitoring for multi-vendor storage arrays from EMC, NetApp, Dell, and others. 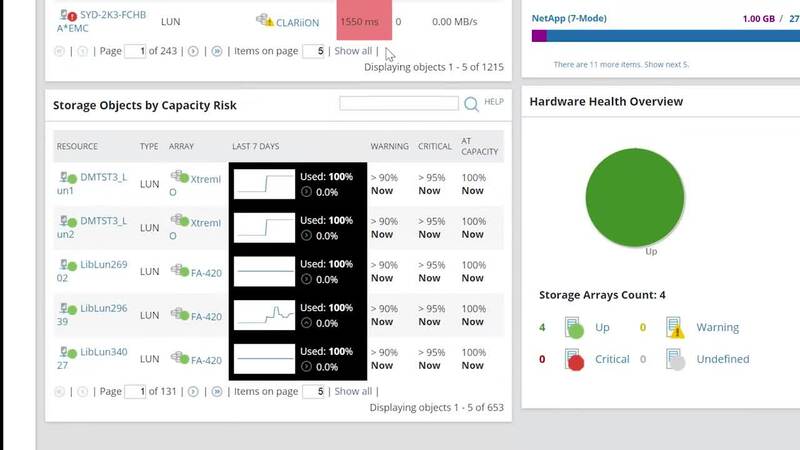 Comprehensive storage resource management tools can provide performance monitoring and alerting across all your storage arrays to help ensure peak performance and avoid capacity surprises. Real-time NAS and SAN performance monitoring capacity planning. Storage Resource Monitor (SRM) can help identify performance problems quickly before they affect your application performance. The storage monitoring software can also provide a clear picture into each layer, array, pool, and LUN/Volume to see storage capacity growth and when space will run out. Get notified about issues with your devices, LUNs, storage pools/RAID groups, CIFS shares, and more. Know about network storage performance problems with easy-to-use alerts and customizable thresholds. Storage Resource Monitor can quickly identify IOPS, throughput, and latency hotspots inside storage devices to identify overworked resources. Instant visibility of all storage layers, extending to virtualization and applications. SRM storage monitoring tool can provide visibility into performance problems, including every layer of your infrastructure, and expandable to see the VMs and applications that are dependent on any storage element. Better to predict, prioritize, and resolve issues before they impact end-users. 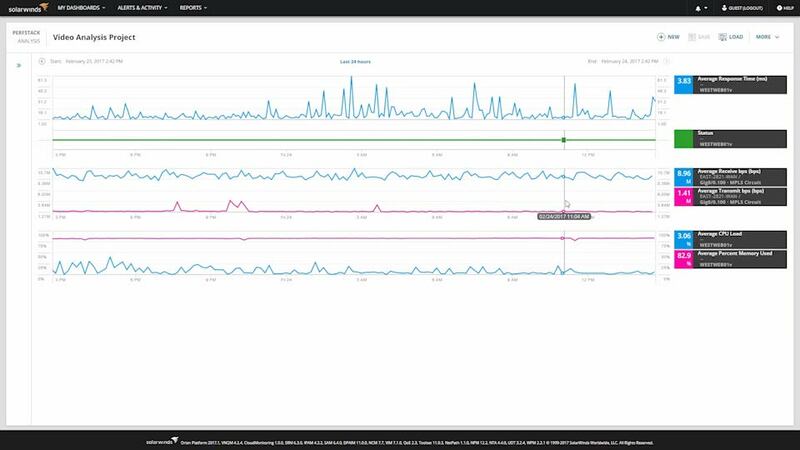 The PerfStack™ feature within the SRM storage monitoring solution can allow you to drag, drop, and overlay performance metrics from your systems data and multiple sources (network, virtualization, storage, or database) and view data types on a single chart. Predefined and custom storage performance and capacity trend reports. It’s easy to read and understand reports on the overall health of your storage arrays with help from SRM storage monitoring software. Data storage management tools can help show capacity trends across multiple vendors without the use of spreadsheets. Features Overview Multi-vendor storage management software and capacity monitoring done right with SolarWinds® Storage Resource Monitor (SRM). Storage Resource Monitor is an industry favorite. Hands down. "With SRM I was able to solve severe disk bottleneck issues. I was able to pinpoint which LUN was causing the issue." "Storage is a black box to most server and network admins. SRM sheds light on that box and uncovers issues for all three teams — storage, network and server — that might have otherwise gone unnoticed and uncorrelated without SRM." "The performance and ability for capacity trending and analysis alone is almost worth the price. I also like the co-joining of the SRM Module with AppStack"
"We use SRM to have a centralized dashboard for the supported Storages. By showing the top 10 LUNs with highest IOPS and latencies we can quickly identify a service problem." "SolarWinds is vital for our business to be able to identify bottlenecks and forecast our capacity needs accurately." Where can I find information on installation and customization for my SRM product? Does SolarWinds offer training or certification for the SRM product? Our New to SRM section was created using customer feedback and contains videos, guides, and articles that will help you be more successful with your installation and customization. SolarWinds offers an onboarding assistance program called Smart Start if you are looking for help getting SRM set up and optimized. We will provide you with access to one of our implementation experts who will work with you to understand your goals, assist you in installing and configuring your product, and help you optimize your environment for how you need your business to run. The SRM Training section is a single location where you can find e-learning as well as instructor-led classes that will take you from the basics through optimization. We allow you to browse classes or, if you prefer, follow customized learning paths to keep you on the right track. Monitoring the performance of storage devices to identify performance problems and troubleshoot bottlenecks. Managing a mix of storage vendors is challenging because you have to rely on multiple tools to keep storage devices and systems functioning like they should. With a unified network storage management software, you can easily identify performance bottlenecks in your infrastructure and quickly take corrective actions. For example, you can receive alerts about response times that are slower than expected across different storage devices. Storage management software should track usage over time and allow you to create predefined and custom reports to see performance metrics and capacity trends in your storage environment. With SRM, you can generate out-of-the-box, web-based reports to see real-time performance data, such as server volumes, NAS volumes, LUNs, and storage pools by capacity—and have a forecasted view of when you’ll reach capacity. To help ensure that storage issues do not affect application availability and performance, you need deep visibility across your IT infrastructure and the ability to troubleshoot performance issues from application to storage. SRM is designed to enable IT pros to better predict, prioritize, and resolve issues before end users are affected. Our application stack environment gives you visibility into all solution layers, extending to virtualization and applications.